Quad Bulb Tree [DIY2A] - $99.95 : Gas Light Conversion to LED!, Looks like a Gas Light! NOW WITH A LIFETIME WARRANTY! Choose stem length, If you have 4 panes of glass in lamphead then you will need the 8" bulb tree. Choose Standard 24v. or Special 12 volt to match your lighting needs. You have an enormous street size lamp head like the one pictured top left of our website and you want it to be as bright as possable. The Quad bulb tree can be customized by ordering the stem and cutting it down to fit. By choosing our LED bulbs you will produce 800 to1600 Lumens in brightness eminating from 4 seperate sockets to bulbs that keep that gas light look and feel. The Charm-Lite bulb tree keeps the seperate socket and bulb design making repairs as simple as changing a light bulb. Try to do that with any other product on the market today. Our Patient bulb tree superior engineering design utilizes copper, not plastic, in bulb tree bulb sockets, providing years of luminous light, without product replacement. Sockets won’t melt, displace or corrode over time, when exposed to moisture or heat. Our Bulb Trees stand the test of time. Our versatile engineering design allows adaptation to 12 or 24-volt systems, and may be parallel or series wired. 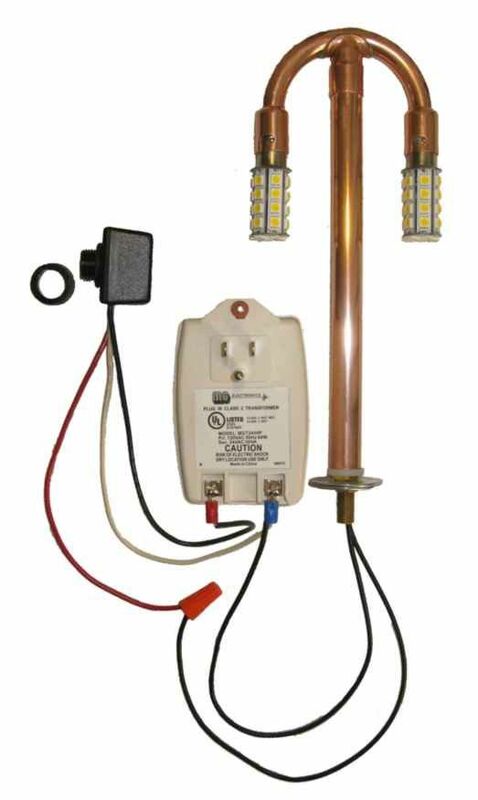 Parallel 12-volt wiring allows usage of one transformer with several other landscape lighting devices. The copper bulb tree is to be powered with a 12 volt or 24 volt electrical supply only.